• Is the damage from mine subsidence? • Will the underground mine result in subsidence in the future? • If subsidence were to occur, what is the range of movement you would expect? • If subsidence does occur, how severe could the resulting damage be? • Was the mine designed properly so that mine subsidence would not result in the future? • How can we mitigate the subsidence risk to a tolerable level? • Can you stabilize the mine and how much would that cost? As you can see from the above, the subject of mine subsidence can actually involve a number of expertise depending upon focus of the investigation. Also, there is the context of the expert mine subsidence investigation: Is it being done for existing or new construction, mine design, review of a mining permit application, or is it for tort litigation? Therefore, in addition to having the technical know-how, and expert with oratorical skills may also be necessary. Karst subsidence are typically in the form of sinkhole to bowl-shaped depressions. They can occur unexpectedly and fairly abruptly and can cause significant damage. Because of their erratic geologic nature, karst it is often difficult to quantify the subsidence risk and associated damage potential. Therefore, the expert which is hired should be well versed in all the subsidence engineering aspects of interest. • What is the chance that there will be subsidence in the future? • If there is a subsidence(s), how severe will it be? • If there is subsidence, how much damage can we expect? • What are my options to reduce the risk of subsidence in the future? • A sinkhole has appeared, what do I do? • Is there any way to virtually eliminate the risk of subsidence in the future? Subsidence investigations in karst terrain are most commonly related to new construction or encountering unanticipated subsidence or other karst features which disrupt construction progress, insurance claims, or subsidence damage. Given the context of the investigation and the amount of risk which may be involved should determine the level of expertise that the subsidence engineer should have. If tort litigation is involved the karst subsidence expert should also be competent in this area. Also, with greater knowledge and experience in karst subsidence problems, the more cost effective the solution. An accurate determination of soil shear strengths in the laboratory is essential to cost effective design and planning for geotechnical projects. One such laboratory method available at MEA is the Direct Shear Test. The test is commonly employed for geotechnical projects where soil shearing along a horizontal plane is anticipated. This applies to landslide remediation, slope stabilization, and pipeline analysis projects. The direct shear machine at MEA can perform tests over a large range of strain rates ranging from 0.00001 to 0.49999 in/min; these rates are suitable for both geotechnical and research projects. MEA’s direct shear machine offers a more customizable strain rate than standard direct shear apparatuses whose rates range from 0.0001 to 0.3 in/min. 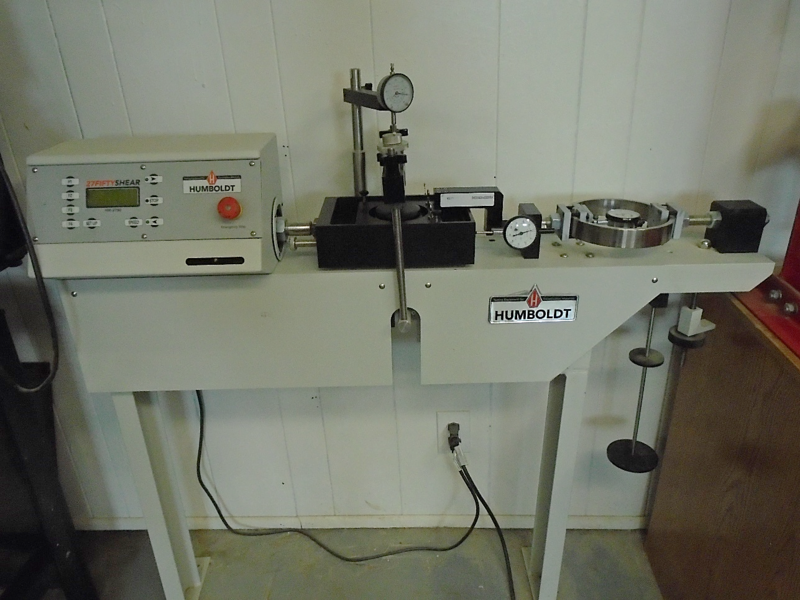 Figure 1 is a picture of our direct shear machine. The purpose of a direct shear test is to determine the shear strength of a soil; this is done by forcing the soil to shear along an induced horizontal plane of weakness at a constant rate. A minimum of three subtests are run where the sample is consolidated using three different weights and then sheared at the same constant rate. 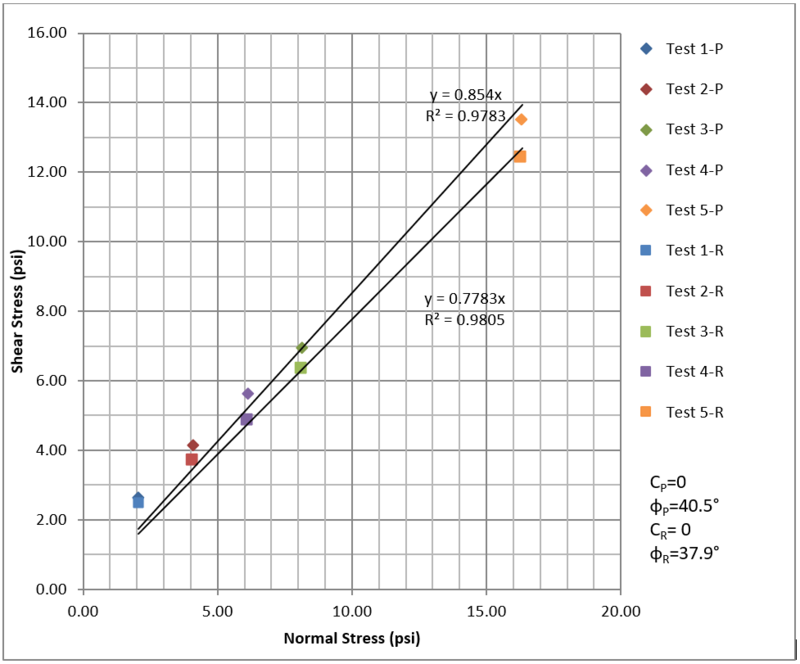 The peak shear stress and residual shear stress of each subtest are recorded and graphed. Using this data, the cohesion and friction angle of the soil can be determined. Figure 2 below shows an example test plot with five separate subtests used to complete the test. The soil in question had no cohesion and a peak friction angle of 40.5º and a residual friction angle of 37.9º. FIGURE 2: AN EXAMPLE TEST PLOT FOR A DIRECT SHEAR TEST WITH FIVE SUBTESTS. “P” IS PEAK SHEAR STRESS AND “R” IS RESIDUAL SHEAR STRESS. The water level in the waterway at the bottom of the slope dropped significantly causing downward seepage forces. More typical causes for landsliding from slope weakening are: waterway bank erosion; man-made undercutting or excavations along the slope; removal of root reinforcement from vegetation; and weathering of the soil mantle. Landsliding can occur slowly to abruptly with little warning. More typical tell-tale signs of slope instability are ground cracking along the slope which is most commonly towards the upper portion of the slope; trees, poles, fences, etc. which are leaning downslope and ground surface bulging of heaving near the bottom of the slope. 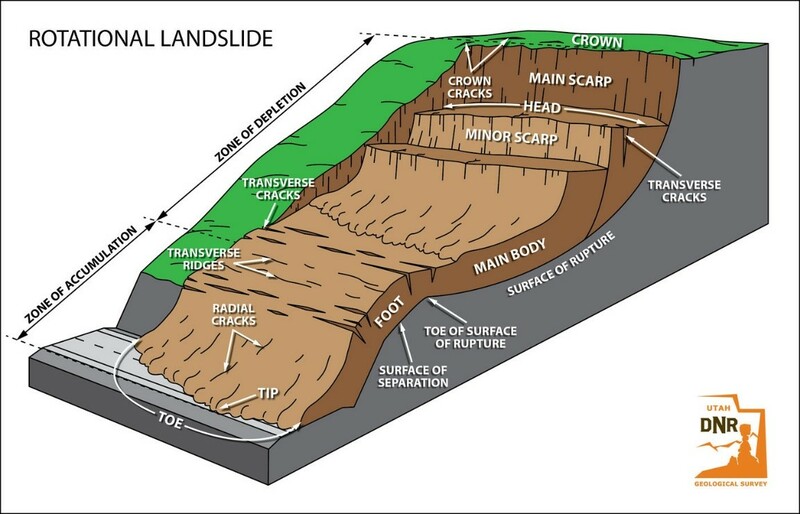 Diagram of an idealized landslide showing commonly used nomenclature for its parts. Courtesy of the Utah Geological Survey.